The Avro RJ previously known as BAE 146 is a medium-sized commercial plane which was developed and made in UK by British Aerospace (which later on became part of BAE Systems). The manufacturing started in 1992. A more-improved version which is the Avro RJX was later developed was announced in 1997. The production program of this kind of aircraft is the 2nd most successful British civil as to the present. The Avro RJ is a regional airliner which is widely used by European Airlines like Brussels Airlines, Swiss International Air Lines and Lufthansa Its best usage is at small city-based airports. 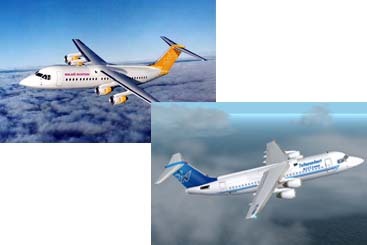 The Avro RJ comes in RJ70, RJ85, and RJ100. The equivalent BAe 146 versions are designated -100, -200 and -300 models.